NEW CANAAN -- Going head-on with an unfamiliar out-of-conference opponent in an elimination game can be tricky business, and those were the circumstances dealt to the No. 6 New Canaan and No. 11 South Windsor field hockey teams at Dunning Stadium on a cloudy Wednesday afternoon. New Canaan took control when Elizabeth Miller's shot was deflected into the top of the South Windsor cage by teammate Abbie Jameson with 17:21 to go in the first half, and that would hold up as the game-winning goal in the Rams' 2-0 first round Class L victory. "I saw the ball coming from Miller. She crossed it from the top of the circle, and I just got around the girl who was on me and stuck my stick out and got the goal," Jameson said. "I think as a whole we were a little slow and we weren't playing to the potential I know we have, but I think in general it's a good start and there's stuff to build off of." The victory for New Canaan (12-3-1-1) sets up tonight's quarterfinal road matchup with FCIAC rival and third-seeded Greenwich (14-3-0-0), who scored a 3-1 win over No. 19 Staples on Wednesday. 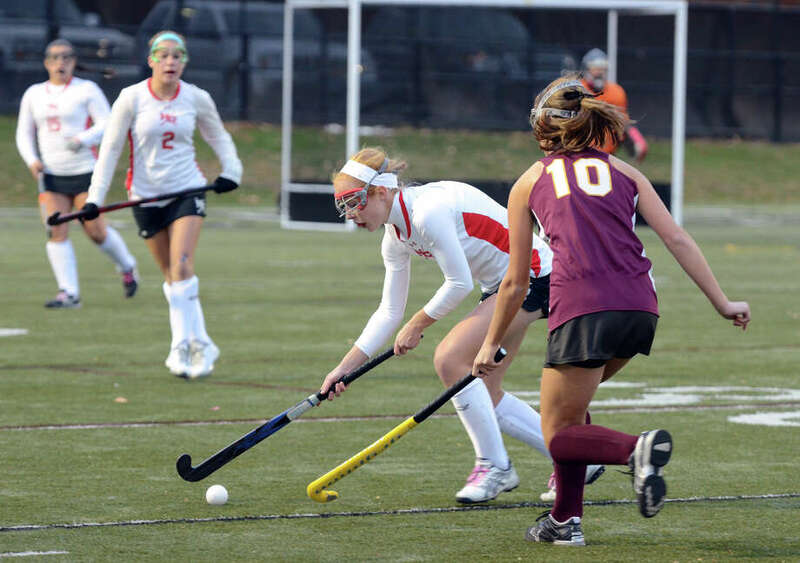 Greenwich defeated New Canaan 3-2 in overtime on Oct. 15 at New Canaan High School. "I saw a while back that we could be headed towards a rematch with them, and I'm excited for it," New Canaan coach Erin Gildea said. "I thought (the first game) was a great game, and when we played it I was hoping to get another crack at them. You're going to run into an FCIAC team at some point in the states." New Canaan continued its first half push, but a blistering shot by Miller was stopped by South Windsor (7-6-2-1) goalie Caitlin Gilligan, who made eight saves. Rhian Ball also notched a shot on goal, but strong defense by South Windsor's Kristen Wnuck and Jackie Kenny prevented further damage. Led by the defense of Rhian Ball and Abby Sherman, the Rams permitted just a single shot. "The defense has been stellar all season. I think that Tess (Decker) was a complete warrior today," Gildea said. "Abbie and Claire (Conley) were steady and in the midfield Miller had a great game and (Emily) Sloan is really steady back there and then of course (goalie) Emma (Ball). So we know that if we can get on the board that our defense can shut anybody out." The Rams didn't have to wait long for the all-important insurance goal in the second half, which came just 1:15 in off a penalty corner. On the play, Decker sent the pass to Miller, whose second rocket shot of the day found the back of the South Windsor cage. "When we came out we knew it was going to be a hard game, but we really got ourselves pumped up and stuck with them the whole game," South Windsor's Kat Adamo said. South Windsor began to spend a bit more time on New Canaan's side of the field in the final seven minutes or so, but creating legitimate scoring chances proved difficult. "We knew coming in that we were the underdog, so we were coming in with a positive attitude," South Windsor's Rebecca Shroder said. "I think we had a great game, and we left it all out there on the field." The Rams now stand three victories away from a Class L state crown. "I think specifically the speed of the game and getting in front of the players was kind of one of our weaknesses today," Jameson said. "As the teams get better, they're going to be faster and we really have to get in front in order to get the goals off." Records: South Windsor 7-6-2-1, New Canaan 12-3-1-1. Goals: NC--Abbie Jameson, Elizabeth Miller. Assists: NC--Miller, Tess Decker. Goalies: SW--Caitlin Gilligan (8 saves); NC--Emma Ball (1). Shots: SW--1; NC--11.